Andy Weir is a space science nerd. His The Martian was so realistic that, when the movie came out, some people were asking when that happened. It was more like Apollo 13 than the sixties schocky Robinson Crusoe on Mars. So now he applies his science nerdiness to the moon in Artemis. How does a city on the moon function? And how does one commit a crime there? And why? The result is the tale of Jasmine Bashara, a would-be EVA Master, porter (one who delivers packages from Earth to residents), and smuggler. Jazz, as she’s known, just wants to get rich. Not stupid rich, but comfortable. She gets her chance when the local billionaire hires her to sabotage the moon’s only aluminum smelting plant. Why would he do that? The plant supplies oxygen to Artemis, Earth’s only lunar colony, in exchange for free power. If she manages to disable the smelter’s four lunar regolith harvesters, she gets a million slugs, the moon’s currency that is much more believable than Bitcoin. When the job goes wrong, murders ensue. Murder is rare in Artemis. And Jazz has to figure out how to make it all right. One of the problems other readers have had with this is that the humor is less organic. Jazz is a cynical type, and her humor is more mean-spirited than Mark Watney’s. But Watney was a mission specialist who hung around with test pilots and engineers. Jazz is a different type of character in a different situation. Whereas Watney is essentially Robinson Crusoe in space, Jazz is an outlaw in a frontier town. She’s very unlikely to complain about farming potatoes to wait for NASA to send a ship or rigging an old space probe to talk to Earth. She is. however, going to be acid-tongued with a dim view of her fellow humans. What has carried over from The Martian is Weir’s eye for detail and love of engineering. 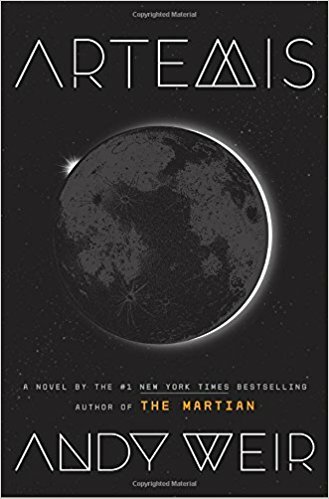 Like Tom Clancy in his early days, Weir writes a treatise on the hows and whys a lunar colony would work, including the politics, the currency, and the culture. He even names the six domes in Artemis after the first six men to walk on the moon. Armstrong is obviously the original. Aldrin is the upscale real estate while Conrad and Bean are workingclass as hell. Not much is said about Shepherd and Mitchell. One of the issues with this type of book is info dumps. You can’t avoid them. In The Martian, he could have a character explain something in the context of keeping Watney alive. (The scene where Watney’s rescue is outlined is hysterical and even funnier in the movie.) For Artemis, some of this is handled by Jazz’s geeky friend Svoboda, who is prone to “As you know, Bob” type monologues. Jazz punctuates this with “Just get to the point!” only to be ignored by Svoboda’s Sheldon Cooper-like enthusiasm for whatever he’s talking about. The book is not as charming or inspiring as The Martian. In fact, the climax is actually rather dark. But in its own way, Artemis is as engrossing. And the scary thing is it suggests that the writers of The Expanse aren’t all that far off the mark.